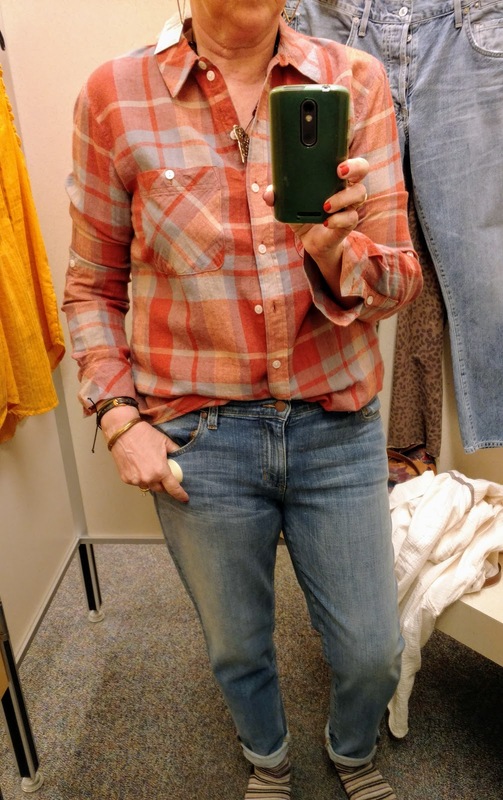 decided, if time allowed, I would do a little shopping with my daughter. Side note: She is moving here! She is living in the apartment with my DH until she can get a job and create a friend/social network of her own. We've been spending a good portion of our time buying things to make the apartment homey and functional. Since the Nordstrom Rack is in the same plaza as the grocery store in Southlake, we popped in. Floral shirt, Size M. I don't remember the brand on this. 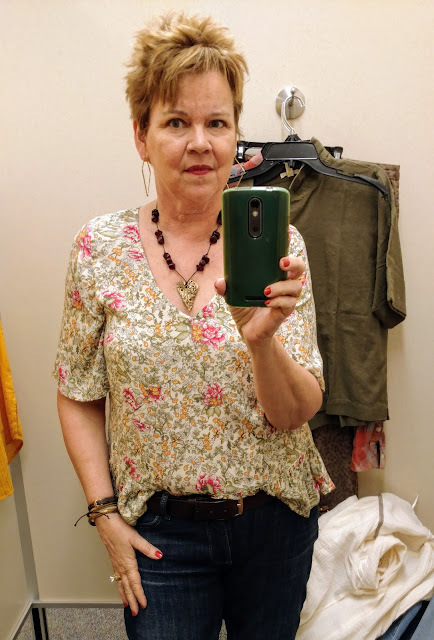 The colors and print are spot on for me and I thought I'd like to give a peplum top a try. It was overly soft, light and flowing, which made it a miss. 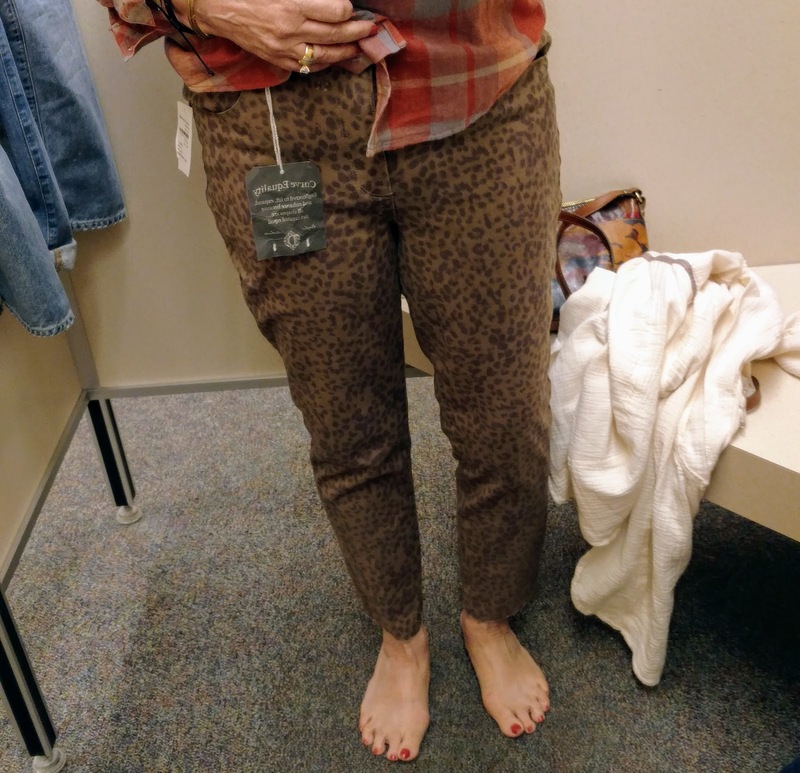 Democracy leopard-print, raw hem jeans, Size 12. The fit was great (I generally have good luck with Democracy brand). The colors were perfect. The length was slightly odd on me, but I figured I could roll them up. They were high waisted. High waists are so unflattering on me. It shows all of my worst features, so they were a miss. Theory plaid top, Size L: Another peplum with fun diagonal details. You can see it gaps and the fabric was too light weight, so hugged me more than I would have liked. It was a miss. 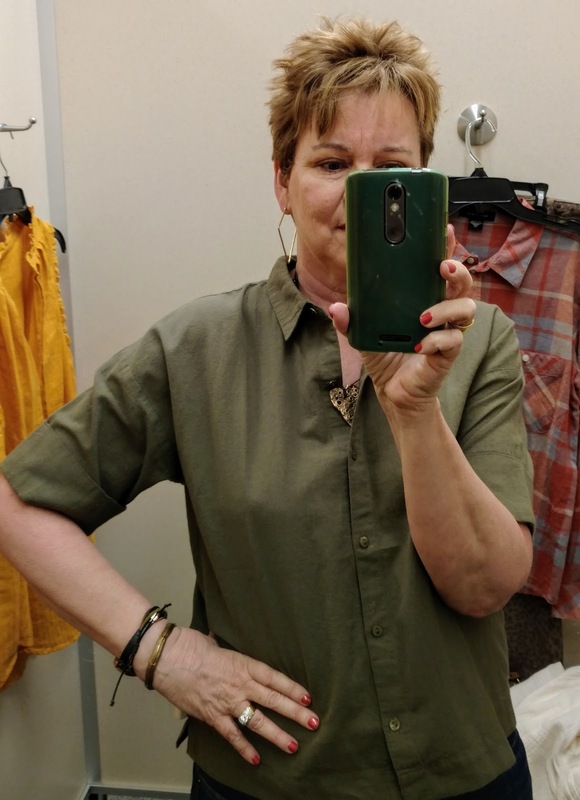 Eileen Fisher cotton linen olive top, Size M: Fabric, color, size all good. I have an unnatural attraction when I find discounted EF. The conservative cut, however, is not the direction my current style is going making it a miss. 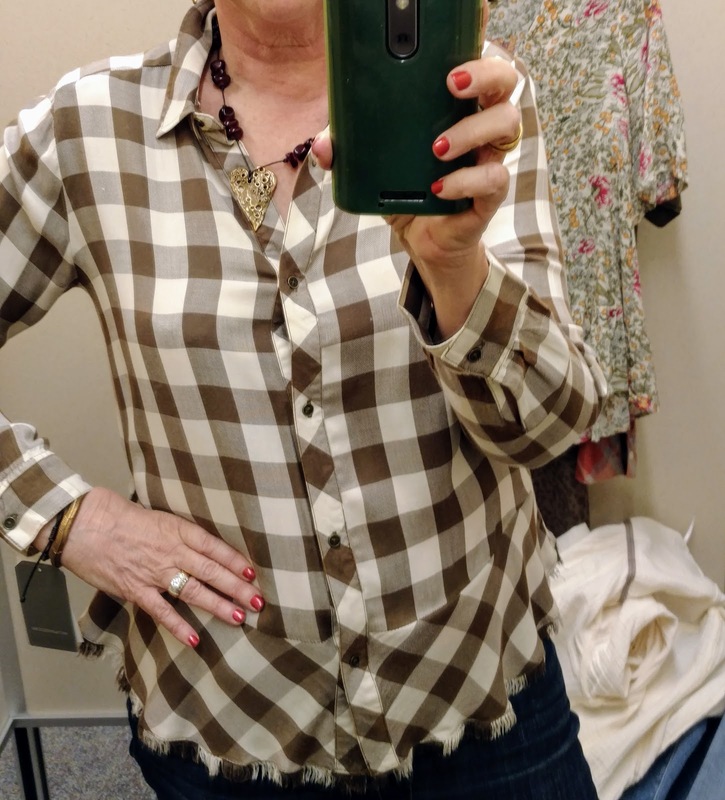 Sanctuary rust/blue plaid top, Size L. This shirt covered all of the bases. Right colors, fit well, light-ish weight. In spite of all of it's good qualities, it wasn't a "Yes, yes, yes!" Making it a miss. Eileen Fisher boyfriend jeans, Size 12: Nice length and fit (slightly big). The crotch area wasn't just right. It seems like a fraction of an inch or the weight of the fabric can make a difference in this area, making them a miss. 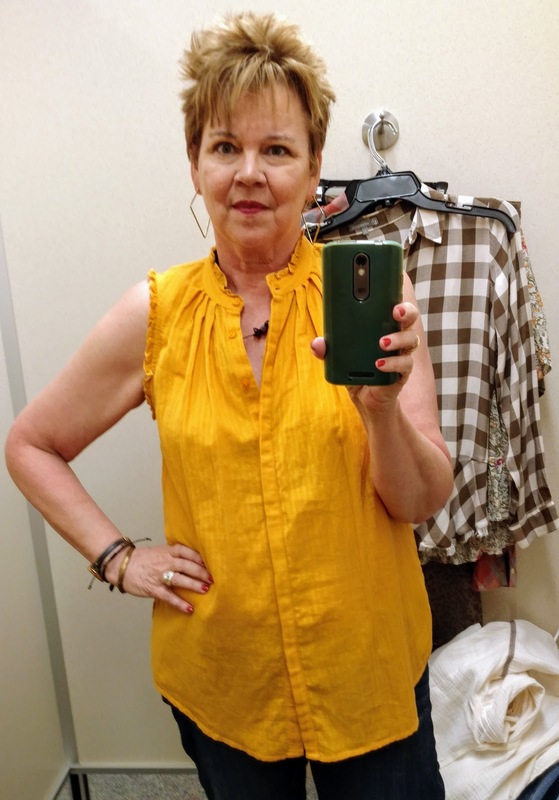 Treasure & Bond yellow-gold sleeveless top, Size L: Great color, substantial cotton fabric, nice ruffle details, generous length, covered button placket. When I picked it up, my daughter's comment was, "That top is 'you' 1000% percent." This will be a great layering piece that will get used over and over making it a hit. Just for fun, the last photo shows a Karl Lagerfeld lip balm. 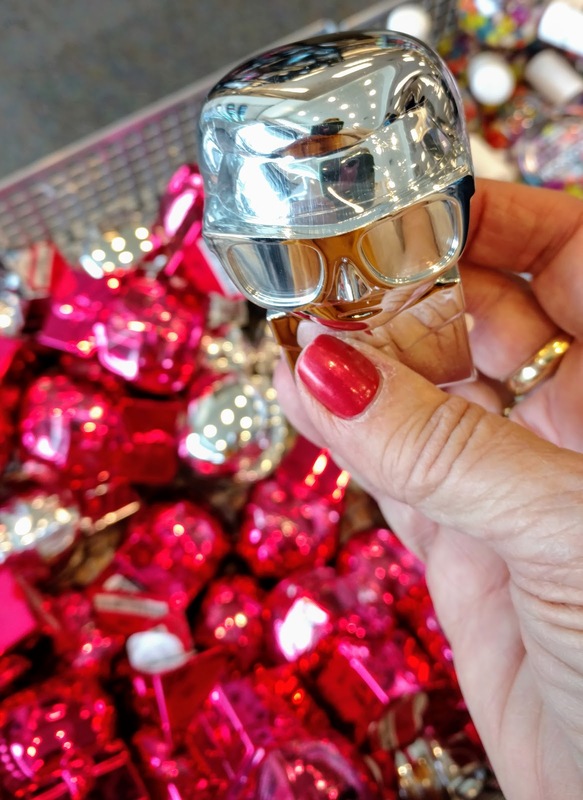 Shortly before his passing, I found a lipgloss at my local Nordstrom Rack. There isn't an online link for these, but your Nordstrom Rack may carry them. It's worth a look, if you're interested. Confession: I had a crazy amount of fun using it as a stick puppet with my 19 yr. old daughter--she played along! While I know there is no guarantee you will find these items at your location, I was able to find some of the exact and similar links, below. I was proud of myself that I stood firm in rejecting items that weren't "Yes x 3." The pickier you are in when purchasing, the more refined your look will become when you get dressed.